For over a year, FLEX alumni in Turkmenabat, Turkmenistan have been running an international art project that aims at fulfilling the main goal of the FLEX program: improving mutual understanding and developing and strengthening long-term relationships between Americans and Turkmen students. The project involved over 70 Turkmen high school students and 30 American students from Quincy Middle School. Throughout the year, students from both countries engaged in creating works of art that they would eventually exchange with one another. In Turkmenistan, the project was led by active FLEX alumna Enayy Kurbanova ’17 (Turkmenabat, Turkmenistan/ Tekonsha, MI), who volunteered at Quincy Middle School during her exchange year in the United States. Enayy worked with the Quincy Middle School art teacher and the Michigan 4H Center, where she regularly attended art classes during her exchange year, to implement the project. Enayy Kurbanova’17 shared, “My primary goal was to increase awareness and appreciation of the similarities and differences between our two cultures and thus, contribute to mutual understanding.” The students from Turkmenistan were engaged in creating works of art that represent Turkmen culture through drawing. The participants were inspired by the nationalist theme and drew Turkmen jewelry, popular historical monuments, Ahalteke horses, and national ornaments. Similarly, American students engaged in making crafts that highlight American culture and lifestyle, such as drawings of well-known cartoons and tourist destinations. 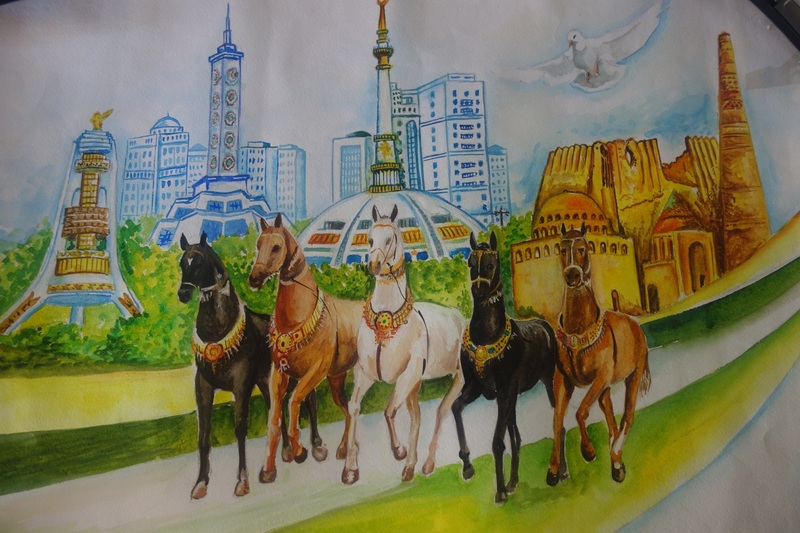 Over the summer, Turkmen artworks will be mailed to the U.S. with the help of the Public Affairs Section of the U.S. Embassy in Turkmenistan and will be displayed at the 4-H Center in Michigan and at Quincy Middle School. The Turkmen participants are very excited to receive American handicraft pieces in return. The entire project was documented through photographs by the Turkmenabat American Corner Assistant Leyla Jumayeva.